In this post, we will discuss the concepts and theories of Thermodynamics. While the topic sounds complicated, we at StudyOrgo have extensive experience instructing principles and reaction mechanisms frequently covered in Organic Chemistry. Sign up today for clear, detailed explanations of over 180 Orgo Chem reactions and reviews on conceptual topics! Remember from general chemistry that equilibrium constant (Keq) reflect the ratio of products to reactants in the following equation. Thus, if one knows the concentration of product or reactant in solution and the Keq for the reaction, the other value can be also know. One point of confusion is that these values should somehow be intuitively known. They are calculated in the lab for each reaction, with each type of reactants. Therefore, without the “empirical” data we wouldn’t know the Keq. Fortunately, many experiments have been done in the world and Keq values are frequently found in tables and reference materials. An important factor in choosing reactions in organic chemistry is knowing how “efficient” this reaction will be. Since our goal to generate products, knowing the Keq for the reaction will allow us to predict how much product we can theoretically produce from a known starting concentration of reactants. We can convert the Keq ratio into energy (kJ/mole) which is a more comparable measurement between reactions using a version of the Gibbs Free Energy equation. Remember, that a release of energy (a negative dG) indicates a spontaneous and forward (towards product) reaction. As a reference, let’s look at a table of corresponding dG and Keq values and how this relates to concentration of products. When dG is negative (exothermic), the Keq is very high (products >> reactants) and we see that most values have a >90% concentration of products when the reaction reaches equilibrium. However, when dG is positive (endothermic), the Keq is very low (products << reactants) and we see most values have <10% products. Therefore, when selecting reactions in your synthesis scheme you will likely want to choose reactions with the highest Keq and most exothermic to generate high concentration. Reaction coordinates are often used to visualize concepts of free energy between the reactants and products of reactions. Below are examples of endothermic and exothermic reactions. The Y-axis reflects the free energy of the reactants (A + B) and products (C + D). The X-axis reflects the progress of the reaction, as the path between reactants and products will have several hills and valleys that reflect transition states and intermediates, respectively which we will cover in another article. The thermodynamics of a reaction can all be visualized from graphs like these. You will see them a lot in the course! 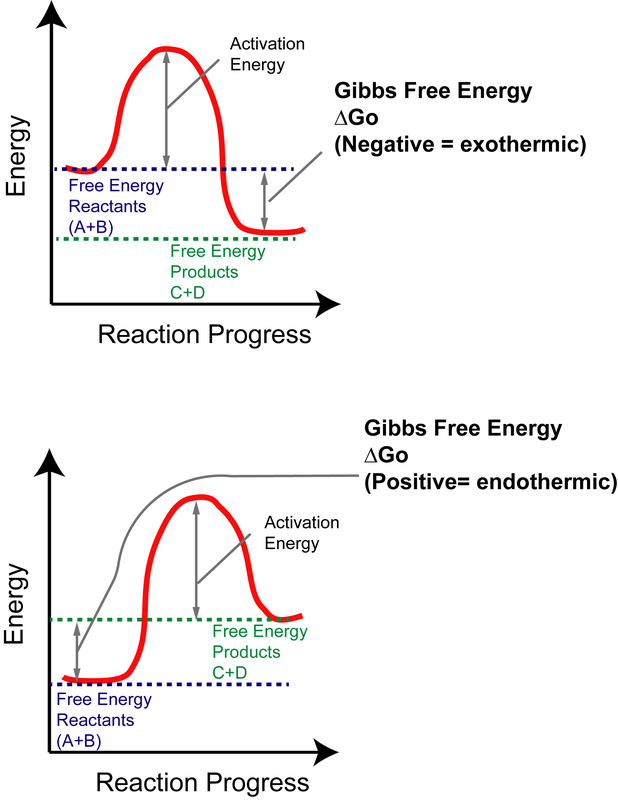 The difference between initial reactant (blue) and final product (green) free energies will give you the Gibbs Free Energy (dG) of the reaction. Remember, negative = spontaneous and positive = not spontaneous. The larger the value, the more complete the reaction goes to either side. For example, a large positive value means low products (no reaction) and large negative value means high products (efficient reaction). Here at StudyOrgo, we have developed easy to follow review study guides and exercise sets to help with reviewing all the concepts you will have to master to pass the course! Check out www.studyorgo.com/summary.php for help with core topics in Orgo 1 that you will need to succeed for next semester! One question that comes up in organic chemistry often is “what is an enol or an enolate and how is it formed?” These types of concepts are frequently covered quickly in class or not at all, but are very important for future reaction mechanisms. We at Study Orgo have the combined experience of over 15 years of tutoring and teaching organic chemistry concepts to struggling students. We have developed clear descriptions of reaction mechanisms and organic chemistry concepts to aid students in their studies. Sign up today for access to over 180 reactions mechanisms and reviews! The alpha carbon of a carbonyl, which is present in carboxylic acids, esters, ketones and aldehydes, are acidic which means the proton can be removed using a base. In neutral or acidic conditions, this means the lone pairs on the C=O position can act as a weak nucleophile. Enols tautomers are generally unstable, preferring the “Keto” version 90-99% of the time versus the “Enol” version. 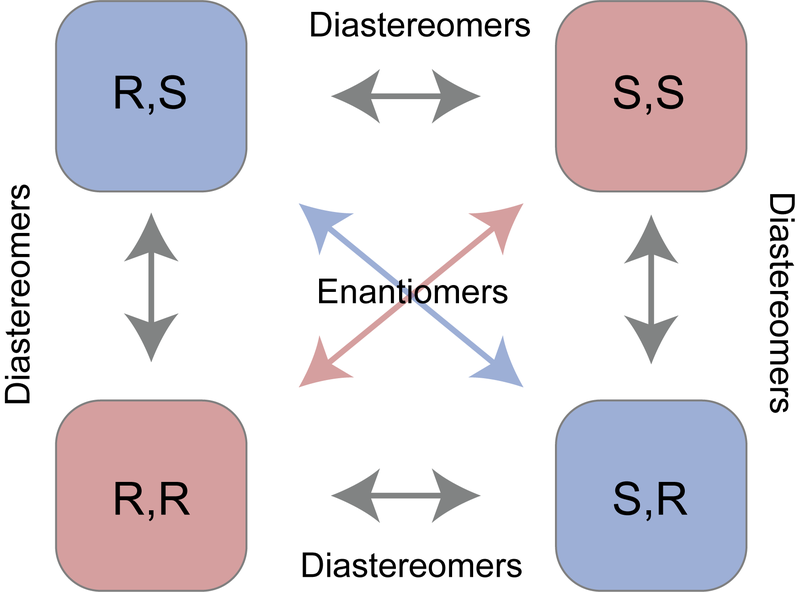 However, a catalytic amount of presence is sometimes enough to drive reactions forward if the mechanism requires the enol tautomer of the compound. However, in some cases such as a beta diketone, shown below, the combined dipoles of two carbonyls makes the alpha carbon very acidic, meaning enol formation is very favorable. In this case, it is 70-90% enol in solution. Catalyist: Strong Base to deprotonate the alpha carbon. Like an Sn2 mechanism, a strong enough base will react with the acidic proton on the alpha carbon and deprotonate. The electron density between the C-H bond will shift to make a new C=C bond, while the C=O electrons will be placed on the oxygen, creating and alkENE + alcohOL anion “ATE”) with a strong base to produce a stable carbanion. The stability is due to the tautomerized structure that can be produced by placing the negative charge on the oxygen. Enolates are generally forward reactions depending on the strength of the base. How strong the base required depends on the pKa of the alpha C-H bond. In the case of ketones, a strong base like LDA is required. However, for beta dikeontes, a mild base like NaOH is enough to generate the enolate. Formation of Enols and Enolates are an important source of carbon nucleophiles to make new C-C bonds in future reactions. Sign up with StudyOrgo today to get access over 180 chemical to reactions with detailed reaction mechanisms, explanations, tips and tricks to each mechanism. How do you to tell when a hydrogen bond will occur? Hydrogen bonding is important for describing the driving force of reactions in organic chemistry and a very important concept for explaining the biochemistry of catalytic reactions that occur using protein as enzymes in biological systems. In this post, we will discuss the rules and examples of hydrogen bond formation. We at StudyOrgo have extensive experience instructing principles and reaction mechanisms frequently covered in Organic Chemistry. Sign up today for clear, detailed explanations of over 180 Orgo Chem reactions and reviews on conceptual topics! Van der Waals (London dispersion forces) – Weak, temporary dipole formed between hydrophobic C-H and C-C bonds. Dipole-Dipole Interactions: – Strong, permanent dipole moments formed between atoms of functional groups containing bonds such as C=O, C=N, C-O, C-N, N-H and O-H bonds. The delta(-) side of one dipole is attracted to the delta(+) side of another molecule, forming a non-covalent electrostatic attraction. Hydrogen Bonding: Sharing sharing of a hydrogen atom covalently attached to an electronegative element (typically O-H and N-H groups) between a lone pair of electrons on another electronegative element. The Hydrogen Bond Donor must be aligned 180 degrees to the Hydrogen Bond Donor! The more intermolecular forces the molecule has, the more energy will be required to disrupt these bonds when melting or boiling compounds, thus raising the observed temperatures from expected relative to their mass. In addition, hydrogen bonds require polar bonds in the molecule and H-Bond Donor proton involved is protic (a donatable hydrogen atom). These are two terms that you will learn in the Sn1 mechanism. Let’s look at ethanol as an example. The hydrogen bonding occurs between the proton of one alcohol group and the oxygen lone pair electrons on another alcohol group. This is a strong intermolecular force that holds the molecule in a complex 3D shape and makes it easier in reactions to attack the carbon connected to the O-H bond due to inductive effects, or the pulling of electrons away from the carbon. Water is an extreme example, where all the atoms in the molecule participate in hydrogen bonding. The oxygen lone pairs will accept a hydrogen from a neighboring molecule O-H. Finally, acetic acid is another example. Remember, that the H-Bond Acceptor can be any lone pairs, including those of C=O bonds. These concepts are really important to understanding the more complex topics to come. With a membership to StudyOrgo, you will get even more tips and tricks on organic chemistry topics and detailed mechanisms with explanations. Today’s blog is a preview of the detailed topics and materials available. Studying ahead for Organic Chemistry this Spring semester is a good way for getting the best grade this semester and keeping up with the rigorous course work in Orgo 2. Most students find the pace of this class very challenging compared to other courses. This is because while there is a lot of information to learn, it also builds on previous concepts from Orgo 1, a course most students want to forget! In your time before classes begin, consider reading ahead or brushing up on some concepts that were covered late last semester to give you a boost right away. 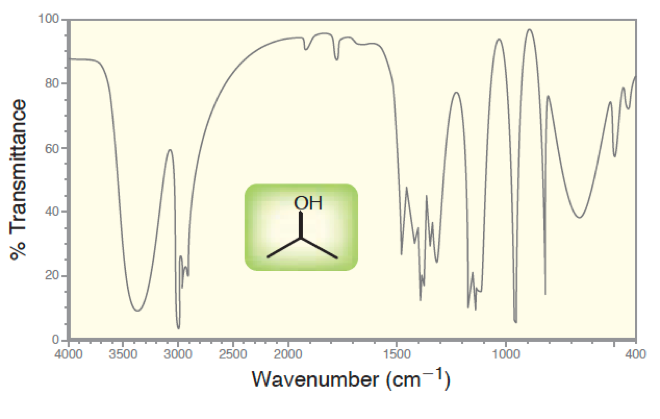 One of the concepts you will need to have mastered quickly in Orgo 2 is the usefulness of Infrared (IR) Spectrometry. In this article, we will break down the key concepts and give you all the info you need to master this technique quickly. A usefulness of using light for analysis is it is relatively non-destructive and cheap to produce. We can see that there are many regions of electromagnetic radiation that we can use for molecular predictions. For instance, long wavelengths like microwaves are used in NMR for determining atomic structure. 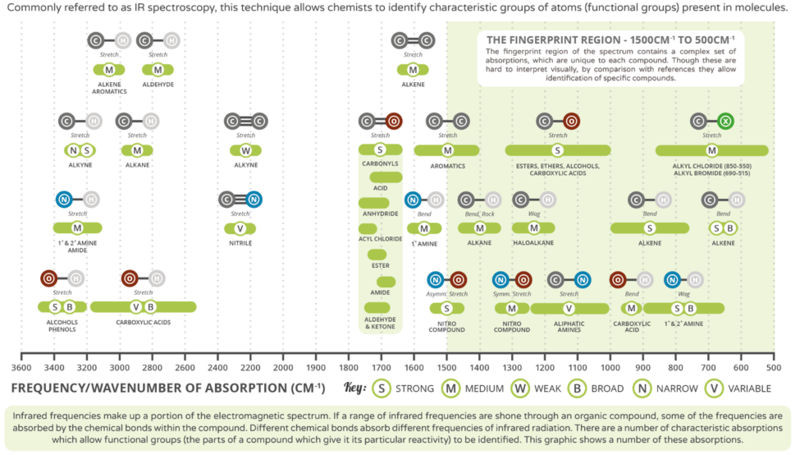 Longer wavelengths like IR and UV/Vis region are used for predicting functional groups and can help you identify unknown compounds. Infrared radiation causes vibrating the bonds between atoms. This is a similar principle to how heating up molecules works, and you may have heard of infrared imaging systems, which can measure the relative temperature of molecules. This technology works on a similar principle to IR spectroscopy, but we use it in the lab to determine functional groups. 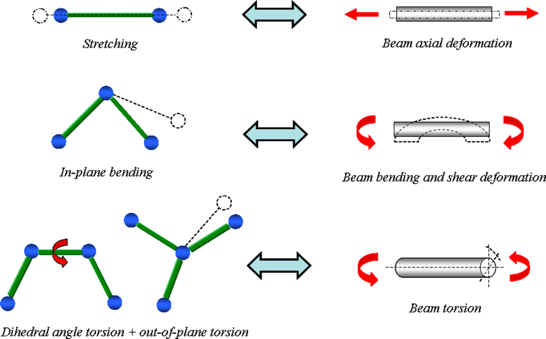 Higher energy regions of the IR spectrum (larger wavenumbers) will cause stretching of bonds where lower energy regions (smaller wavenumbers) will cause bending and twisting. Thus, depending on the type of bond and the atoms involved in the bond, we can predict what they are based on which wavenumber region they absorb. 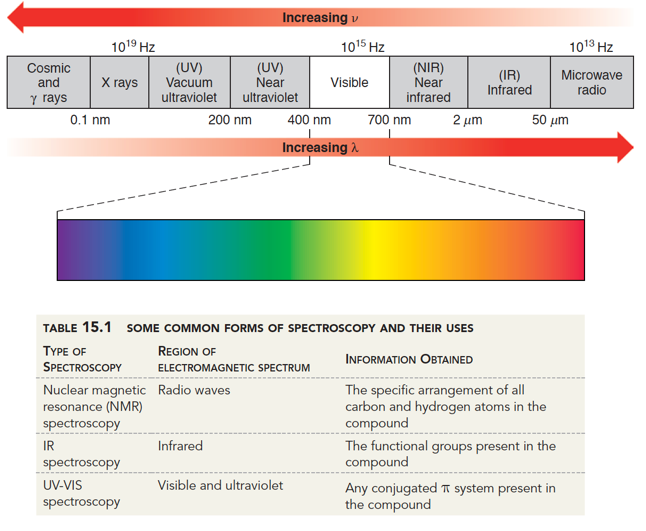 There are 3 pieces of information you can get from the IR spectrum of samples. In the graph above, we can see the IR spectrum for isopropanol. We see that the range of wavenumbers (inversely proportional to wavelength), there are multiple regions that are causing unqiue-looking signals. The functional groups are alkane and alcohol. Almost all your moleucles will have C-C and C-H bonds, so many o fhtese signals are not useful. But an alcohol is unqiue, with a large peak at 3400. Signal Intensity Some signals will be weak and some will be strong, as we see in the figure above. This has to do with how efficiently the region is being absorbed by the molecule. If it is a strong signal it should be consistent and easy to detect. However some bonds are not as efficient. With these signals, sometimes you miss them because they are too weak. So if you think you may have a functional group but the peak is not there, remember it maybe “invisible” if it is a weak signal. Signal Shape Most types of bonds will absorb in a very narrow region of the IR, giving the typical narrow signal shape. Only a few types of bonds will case large regions of the spectrum to absorb, causes a broad signal. These always are functional groups that can undergo hydrogen bonding, such as O-H, N-H, C=O, etc. Typcially OH and COOH functional groups are very broad, while carbonyls are amines are more broad than ususal. We have placed a typical carboxylic acid spectrum on top of this trend chart to help you learn the various signals that you will encounter. Signals in the “fingerprint” region are useful for matching you unknown to a known standard, too usually too “noisey” to predict anything. You can see that the broad OH peak at 3400 cm-1 and the C=O peak at 1710 cm-1 falls very neatly in the trend. This is just an example of the clear-cut description of Orgo 2 concepts that we explain at StudyOrgo.com. Sign up to day to get ahead on over 175 reactions commonly covered in these classes!